Pull the trigger. Snap a picture. The revolver camera is old, but not as odd as one might think. It may even seem weird and potentially even a little morbid. Theoretically, the shooter could capture a photo of the target at the moment of impact. But is this technology really as odd and antiquated as it appears, or simply a design a half-century ahead of its time? Revolver camera. Pulling the trigger simultaneously fires a round and snaps a picture. 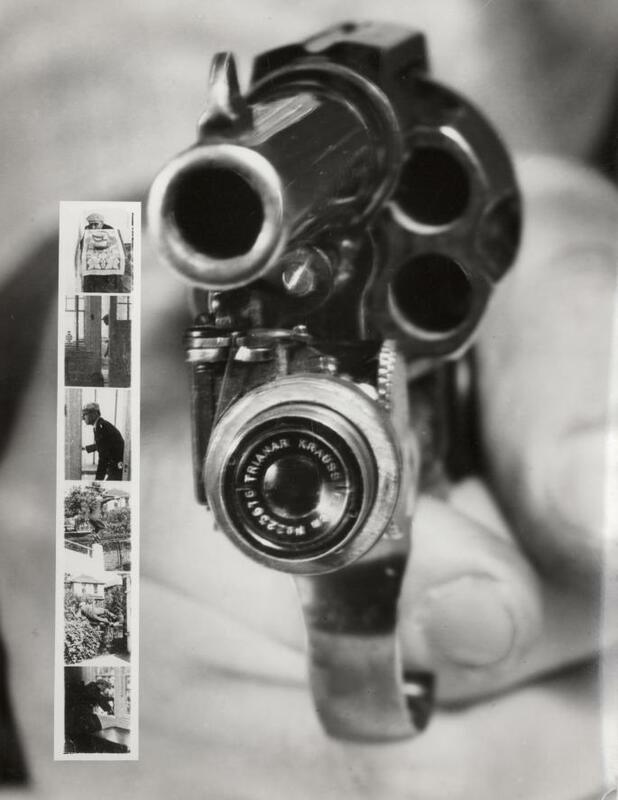 Though the revolver camera’s history is pretty blurry, records indicate this contraption was created and photographed in 1938 in New York. The only known surviving photos come from the Nationaal Archief of the Netherlands, where the gun-camera now calls home. What’s not so clear is where the gun came from, whose brainchild it was, and whether its intended use was pure novelty or true invention. The device itself is a very tiny camera attached to both the underside of the barrel and front of the trigger guard of a Colt .38 special revolver. The camera was somehow configured so that each time the trigger was pulled, a photo was snapped simultaneously. These black-and-white still images of times either just prior to — or more likely just after — impact left something to the imagination, unlike today’s streaming video. No doubt, the revolver camera was lens to which you don’t want to say cheese, smile or wait for the flash. There’s no evidence that this gun was actually put to use other than for trial photo shoots and practice runs — sans bullets, we assume. Unfortunately, few photos of-and-by the revolver survive today. The only surviving images — the actual camera and the six inset images it snapped — were actually posted on Flickr by the Nationaal Archief in the hopes of gathering more information about the revolver camera’s history. So far, all they’ve gathered are oohs, ahhs, and gun puns. The true history of this novel(ty) idea may never be known.